An unforgettable film about the redemptive power of Christ's love. Through a bizarre turn of events, Murell Parsons, the church janitor, becomes the leader of the high school youth group and creates an uproar with his uncoventional approach. At first, Murell (an African American bachelor working among a whites-only church) can't get through to the apathetic teenagers, particularly the pastor's son, Sloane. But gradually, he succeeds where other youth leaders have failed, relying upon his streetsmarts and down-to-earth Christian faith. Things reach a crisis when Murell doesn't follow church regulations, and Sloane's anger drives him to the point of self-destruction. 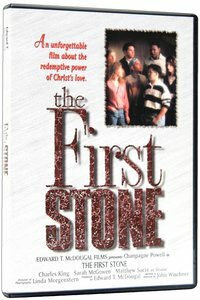 The First Stone is an unforgettable film about the redemptive power of Christ's love. This unique story will inspire viewers to become more compassionate toward the dying world around them.